Roulette Balls, Markers, Chip Racks, Wheel Covers, and More! Choose from our complete line of roulette win markers, marker buttons, wheel shields, balls, and many other roulette supplies all available for immediate shipment. 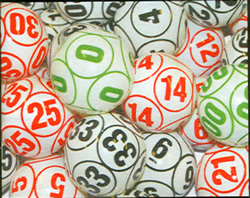 Roulette Balls are available in five sizes. We carry: 3/8-inch roulette balls, 1/2-inch roulette balls, 5/8-inch roulette balls, 3/4-inch roulette balls, and 7/8-inch roulette balls. 16 Inch Roulette Wheel 3/8" or 1/2"
18 Inch Roulette Wheel 3/8" or 1/2"
19 Inch Roulette Wheel 1/2"
22 Inch Roulette Wheel 5/8"
25 Inch Roulette Wheel 5/8"
27 Inch Roulette Wheel 5/8" or 3/4"
30 Inch Roulette Wheel 3/4"
32 Inch Roulette Wheel 3/4" or 7/8"
Our Ivorine Roulette Balls are available in 18mm and 21mm sizes and are casino quality. This Ping Pong Ball Roulette Set has 38 1.5" diameter balls numbered 0 and 00 through 36. These Ping Pong Ball Size Roulette Balls are great for conducting roulette and other activities, and they feature ten-sided balls with the numbers imprinted in black, green, or red. This upright display rack features eight slots on each side for roulette chips and lammers. The rack measures 20" tall. Sale Price: $18.48. Was $32.50. Save 43%. This eight-hole roulette chip display rack features clear and black acrylic construction. Each rack measures 16" long. Sale Price: $16.13. Was $32.50. Save 50%. Our Roulette Win Markers are available in a variety of colors and styles. Choose from Brass Win Markers, Acrylic Cylinder Win Markers, and Acrylic Pyramid Win Markers. Pyramid and Cylinder Marker Sale Price: $5.89. Was $9.95. Save 41%! Please feel free to browse our wide selection of Roulette Supplies including, Roulette Chips, Roulette Layouts, Roulette Wheels, and Much More! For more information on any of our Roulette Supplies or Roulette Tables, please feel free to contact us at 1-800-233-0828. You can also get a Free 104 Page Casino Supplies Catalog via our quick and easy online form.